Everyone looks forward to payday; but of course, if your job duties include payroll, then the approach of payday is also something to be dreaded to some degree. For many companies, putting together payroll involves a lot of drudgery and is an inherently error prone process. This is especially true for construction businesses and other companies whose employees largely work on remote job sites where time tracking is done by means of time sheets filled out by hand on a weekly basis. We all know how hard it can be to read other people’s handwriting at times. 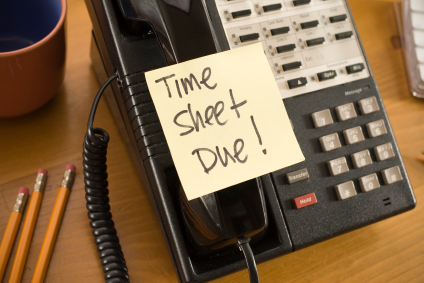 While a time card stamped by a Bundy clock can be difficult enough to read, a handwritten time sheet can be next to impossible to decipher – and very easy to misinterpret, leading to potentially costly payroll errors. It’s not an easy way to do things and it invariably leads to higher than necessary labor costs. If you’re still using time sheets in your business, it’s time to ask yourself if it isn’t time to begin using something a lot more accurate and much easier on your bookkeepers. Portable time tracking has come a long way in the past few years. Instead of time sheets, you could be using an electronic time tracking system which can be installed on the job site. These modern portable time clocks can import employee hours into your payroll or accounting software directly, so there’s no more time sheets to go over by hand and no chance of human error costing your company money. Of course, you might currently outsource your company’s payroll to another company. It’s not cheap, but it may well be worth it to avoid all of the hassle which comes with putting together your payroll from all of those time sheets. When you decide to modernize and streamline your payroll procedures by upgrading to a portable time tracking system, you can save on this cost. With one of these modern mobile timekeeping solutions, payroll goes from a major headache to a quick, easy job which one employee can handle in almost no time at all; a huge improvement over how things used to be done. The cost of a portable time clock is an investment which pays for itself incredibly quickly, since it begins saving your firm money from the first day it’s in use and keeps providing you with substantial savings for the life of the system. Make things easier for your staff and for your entire business by getting with the times and using a portable time tracking system which saves you both time and money. After all, shouldn’t payday be something everyone can look forward to, not dread?